During the Franco-Prussian war, 1871-1872, France stopped being an Empire and Germany became one. 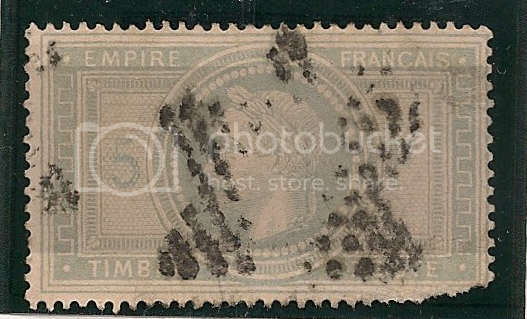 As the Germans besieged Paris where the printing presses were, what was left of the French government had some stamps hurriedly printed in Bordeaux that approximated French Ceres issues. 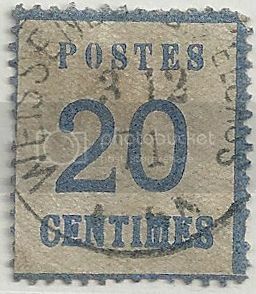 There were successive efforts to improve on the 20c blue stamp. As these stamps closely resemble other French and Colonial issues, I am not completely certain I have finally finished this set. I had to replace some that turned out to be, as they say, not as described. Meanwhile, inside besieged Paris, old Ceres plates were available to make new stamps. Specialized catalogs devote several pages to the postal history of the balloons that carried mail in random directions, preferably not to points behind enemy lines. Those balloon bundles were in effect the first air mail. I am more curious as to the postal history of what was going on inside Paris at the time, which included the uprising known as the Paris Commune that inspired Marx and Lenin. France, meanwhile, ceased to be an Empire. This stamp is also an example of how flaws can make key stamps more affordable. Normally I keep to back-of-stamp flaws (you do not want to know the thins and repairs that made that Bordeaux set possible), but here, a little tiny rip saved me an entire month's rent. Are there any other stamps you can think of that are relevant to the Franco-Prussian war? Please post them here. In the meantime, I will move my energies here to the Great War. After all, we are in the midst of its anniversary. My step-grandfather, whose album the German Empire set is from, fought in it (on the German side) but spent most of the war as a POW in the Alsace. The scan is from his childhood album (Schaubek, 1913) from just before he went off to war. The French scans are from an album I got in childhood in Nancy (in Lorraine) in 1972, but only in recent years have managed to fill up. I find these stamps to be very interesting. During the 1870 occupation of Alsace and Lorraine, Germany issued these stamps for the province because they needed stamps expressed in French currency. Seven denominations were issued, in which there are two varieties. Background network points up, and background network points down. These issues have the distinction of being the first occupation stamps ever issued. If you collect these, you should be aware that official imitations of all values were made in 1885 in Hamburg. Imitations are of the network down variety and since new plates were made for the text, the easiest way to distinguish imitations is as follows: Draw an imaginary line from the upper left corner of the rectangular border to the lower right corner. The line should pass through the lower part of the ‘P‘, while on reprints it will pass just below the center of the ‘P’. All of your stamps appear to be genuine, (unless your scan is distorted). 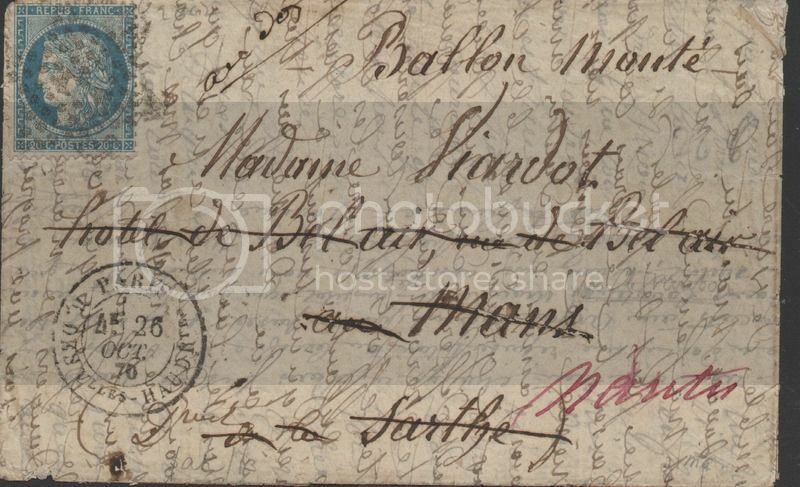 Here are a couple of genuine copies with nice postmarks during the Franco Prussian War. I left out of the scan one 'reprint' and one stamp of the 'points down' variety. What I am not clear about is just where those stamps were used. Were they just used in Alsace, in Alsace-Lorraine, or in the entire zone occupied by the Prussian army? That Lothringen postmark shows that it was used in Lorraine. Actually, on the Prussian side, several powerful German States in the south which were not part of the North German Confederation (such as Baden, Bavaria and Württemberg) joined Prussia in the war against France. All of them became part of the Greater German Empire after the war. Here are some stamps issued by those nations during the Franco Prussian War. 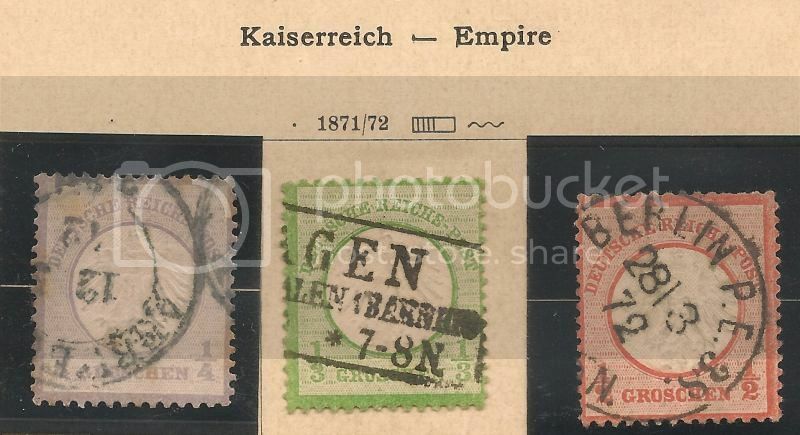 Kingdom of Bavaria - joined the German Empire after the Franco Prussian War, but continued to issue stamps due to a postal agreement with the Empire. Bavaria continued to issue stamps until 1920, with the defeat of the Empire in WW1 and the formation of the Weimer Republic. Here are my stamps issued during the Franco Prussian War. Grand Duchy of Baden - On 31 Dec, 1871 the postal system of Baden changed to the German Reichspost. Baden’s stamps could be used until the end of 1871, and Baden stamps could be exchanged for stamps of the German Reich until February 25, 1872. Here are my stamps of Baden which were in use during the Franco Prussian War. Kingdom of Wurttemberg - Also allied with Prussia during the Franco Prussian War and become part of the Empire on 31 Dec, 1871. 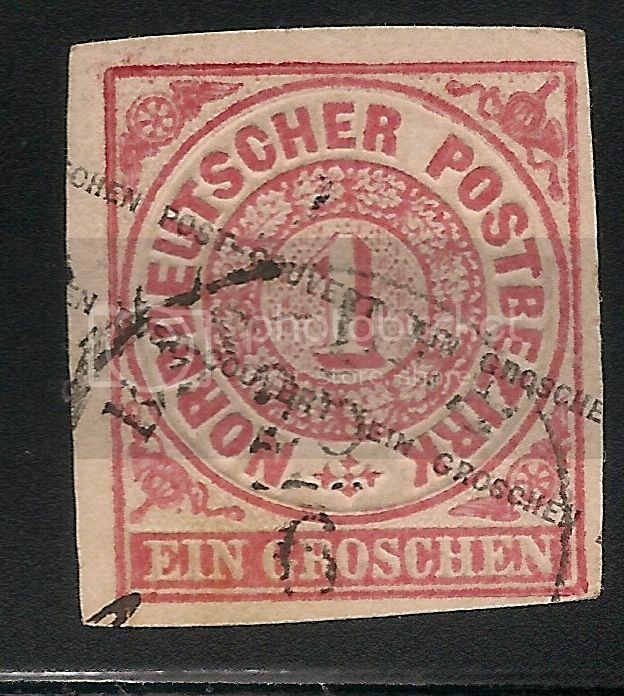 Like Bavaria, Wurttemberg continued to enjoy postal autonomy which ended on 31 Mar, 1902 (which they continued to issue official stamps until 1923). I have not organized by Wurttemberg stamps, but here are three which were issued from 1869-1873. Scott #s 47, 49 and 50. These stamps were valid for use throughout occupied France until the end of the war, then they became valid for use only in Alsace and Lorraine until the region was annexed and fully incorporated into the German Empire and German stamps came into use. 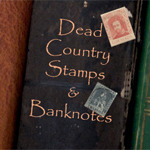 I don't know the exact date that the stamps were discontinued, but it was probably sometime in 1872. During the siege of Paris, outgoing mail was sent by balloon. These were in effect the very first airmail covers. They landed randomly. If they landed in the English channel, they were lost. If they landed behind enemy lines, they generally had to wait for the end of hostilities but sometimes such mail was kindly forwarded. This one was lifted out of the city on Oct 27 in the balloon, "Vauban". It hit a storm, and did land in occupied territory, but the mail got through. What a great thread - thanks for reviving it. What I am not clear about is just where those stamps were used. Were they just used in Alsace, in Alsace-Lorraine, or in the entire zone occupied by the Prussian army? I checked the Michel catalog and they state that - as Michael already pointed out - the occupation issues were valid in all of the occupied territory. 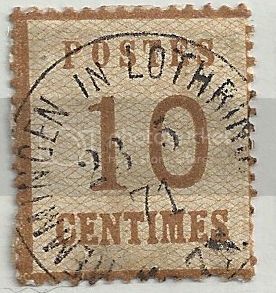 Furthermore, they were valid for use until December 31, 1871 and superseded by the issues of the German Reich - just as the issues from the Norddeutscher Postbezirk. Bumping this up for our Thread of the Week.